Event Toyoshima Machiko "Jibun no Ichiban"
The commemoration event for Toyoshima Machiko's first solo single, Jibun no Ichiban, took place on March 21, 1998 at Sunshine City in Ikebukuro. It was held in the open area, so anyone who wanted to watch was able to watch.. but it was pretty crowded. The first two floors were pretty much full, and there were people watching from the third and fourth floors. After the live and talk show, there was a handshake session for those who bought Machiko's CD. The emcee for the event was Don Maccau, Machiko's partner in the radio show Game Walker Net. 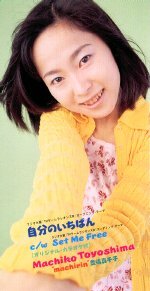 Machiko was wearing almost the same outfit as on the jacket of the CD single (yellow cardigan, flower blouse, mini skirt, and high heels). After a short talk, Machiko sang Jibun no Ichiban. This was a song that Machiko wrote the lyrics for herself. This song was also the opening song for the radio show, TV Radions R.
Then Naitou Kan came as a special guest. (Kan is Machiko's partner on TV Radions R.) They all read some letters, just like on the radio shows. Machiko said that she will be at the Tokyo Game Show the next day, for a Sentimental Graffiti event. Then Machiko sang Olive no Kaze, which was the new song by Sugihara Manami, going on sale 4/21. This song was really a duet, but she sang it alone. Machiko said that they were passing out some flyers for this CD at the Tokyo Game Show (only that day). Then they gave away 5 signed posters as presents. The last song that Machiko sang was Set Me Free. Machiko said that she will have her "Minimum Live" in Tokyo and Osaka later. She is planning on singing around 10 songs. To get a ticket, one has to send in the stub from her CD single, and there will be a drawing (200 people in Tokyo and 300 in Osaka). Machiko said that she will release a video (called "Minimum"). It will have clips from her CD recording, and "Minimum Live". Machiko also announced that she will have a new solo radio show in the Tokyo (and Osaka) areas. It will be a radio show for the game "To Heart". The talk and live show was about one hour, and then they went into the handshake session. There was a total of 700 or so people, so it took a LONG time.. It looked like Machiko was very tired at the end.